A pair of large, curved horns from an Alpine ibex confiscated by the Ili detachment. A species of wild goat that lives in the mountains, the endangered animal has been hunted ruthlessly for its magnificent horns. Kul Durning, which means “transverse valley” in the local dialect, is located in the eastern mountainous area of Gongliu County in Ili. Known as a treasure trove of wildlife in Eurasia, the national nature reserve is home to the largest virgin spruce forest in China as well as abundant and diverse species of wild animals. Since so few people visit the area throughout the year and dense forest is blanketed with moss, shrubs and trees growing on top of each other, mountain paths often “disappear” in the thick vegetation and travelers may get lost. Soon after the operation began, the detachment received a tip from a local herder that some people were conducting suspicious activities on a nearby hill in a white tent. Xu, a seasoned anti-poaching officer, immediately ordered his tactical team to surround and lock down the nearby area before nearing the target. At the same time, other officers, soldiers and forest police participating in the operation quickly took positions in the area and closed off all possible escape routes for the poachers. Closing in quickly, Xu and his fellow officers neared the targeted tent. Alongside Xu at the front was Imam Roza. Locally born and raised at the foot of Tianshan Mountains, Imam was recruited by the detachment only a year ago. Previously, he was not included in this particular operation. But the local native has a special passion for wildlife and requested to help such efforts. Eventually, he was allowed to participate. On the count of three, they stormed into the tent, but found no one there. Embers from a fire near the tent indicated that those people had been there recently. The team combed the area and soon found beat-up bedding, leftover nang (a local style of bread), a handful of rusty steel traps and nets and a pair of large, backwards-curving horns from an Alpine ibex. They also found a pool of dried blood on the ground. It was clear that this tent had served as a base for poachers. Good news soon arrived: A few kilometers from the tent, several fleeing young men were stopped by officers. In their bulging bags were young greater spotted eagles, which are under second-class state protection in China. Ili detachment of Xinjiang forest division under China’s armed police forces during an anti-poaching operation. The detachment shoulders the responsibility of protecting the ecological security of all of the forestry areas in Ili. For armed police officers in the Ili detachment, anti-poaching operations like “mountain clearing” have long been routine tasks. They shoulder the responsibility of protecting the ecological security in all of the forested areas of Ili, which boasts rich biodiversity, with around 1,000 species of plants and 350 species of wild animals calling it home. However, precisely because of this rich biodiversity, poaching was once rampant in Ili. In the late 1990s, poaching was so widespread that a complete trading chain had formed including poachers, local dealers, smugglers, processors and end customers. At the bottom of the chain were the poachers who took the biggest risk. Most were locals and survived on meager incomes, but were familiar with local topography. They were of all ages. One deal would net them several thousand or even several hundred yuan, sometimes less than a thousandth of the end sale. But some were still willing to take such a “job” because a payout from a single deal was attractive compared to the equivalent six months of salaried labor. Buyers usually came from neighboring provinces. They either hired locals to hunt for them or purchased directly on the black market. The “goods” they spent several hundred yuan to purchase could sell for tens of thousands of yuan. 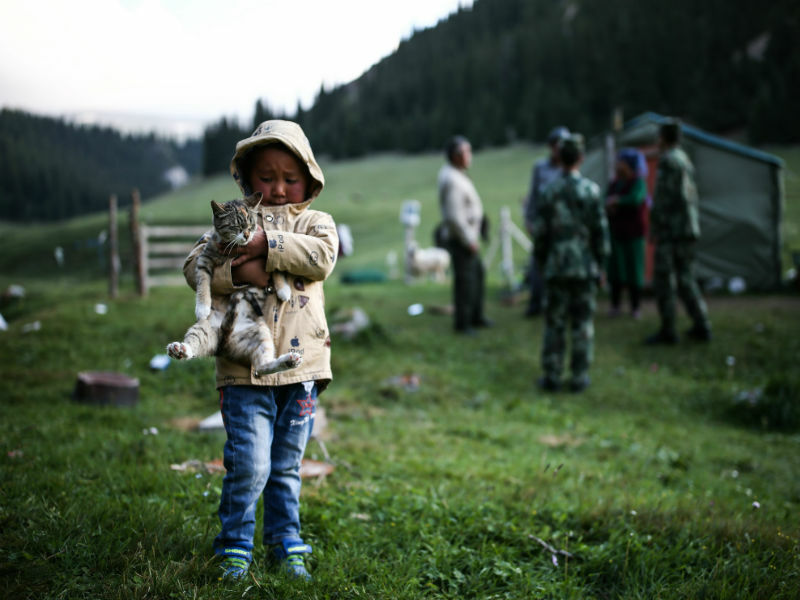 A local child holds his cat in Kul Durning, Ili. The fact that not many people inhabit around or even visit this area throughout year is a reason it can sustain such lush vegetation and rich biodiversity. Since the late 1980s, illegal wildlife trading has become another black market problem alongside drugs, weapons and human trafficking. Poachers in China began to be active around the same period. Thus, when The Law of the People’s Republic of China on the Protection of Wildlife was passed in 1988, Ili began to organize anti-poaching operations. Later, the forest division under China’s armed police forces began to launch armed anti-poaching projects in Xinjiang and many other places in the country. 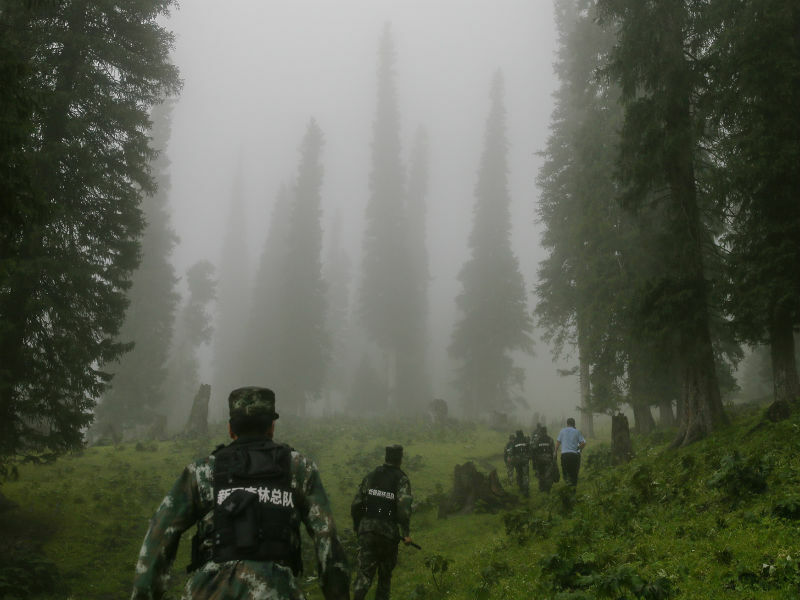 Along with anti-poaching operations and crackdowns on theft of forest resources, the Ili detachment sends brigades year-round into key forest zones under its administration to patrol and to protect wildlife. In recent years, alongside other local agencies and institutions, they carried out around 30 joint operations on ecological protection, arrested 140 lawbreakers and saved 30 wild animals under state protection. In 2016, China issued a revised law on wildlife protection. 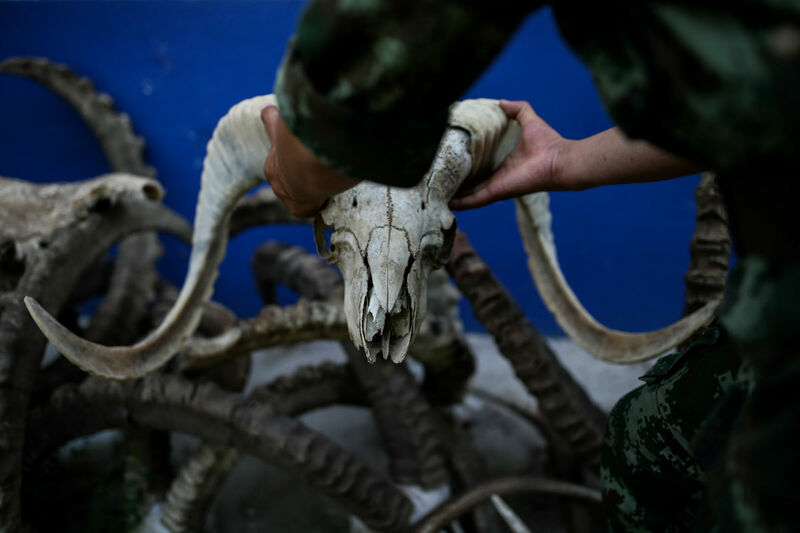 Together with related clauses in the country’s criminal law, China increased punishments for poaching and other related crimes such as smuggling and purchasing contraband. Although Xinjiang has witnessed steady growth of forest resources in recent years, the autonomous region’s total forest resources remain insufficient due to its far distance from ocean and frequent sandstorms, among other reasons. If certain wildlife and plants are threatened, the entire ecology can easily become unbalanced. Xu Zhefeng, Imam and their colleagues are now doing their best to maintain natural harmony and improve the ecological environment of the land on which they live. “Through our work, we hope more people will truly understand the importance of peaceful coexistence between man, nature and wildlife,” added Xu.